Late yesterday afternoon (Friday 30th January 2015) I ventured up to the Monarto Conservation Park (CP) for the second Summer afternoon/evening activation event for the VK5 National and Conservation Parks Award. I have activated Monarto a number of times previously, but it is close to home, just 30 km east of my home qth in the Adelaide Hills. So access time to the park is good. And it is a great park for night time activation, as there is a good carpark off the road, and some good options for setting up a table and chairs and stretching out the dipole. I set up in my usual spot, which is the carpark in the north eastern corner of the park, just off Ferries McDonald Road. You need to keep a close eye out for the park sign as you travel south, as it can be easily missed. The entrance is a few km from the South Eastern Freeway Monarto interchange. As I’ve mentioned, this is a great little spot to set up, and if you are inclined, there is a fantastic ring route around the park, that you can walk from this location, to get a feel for the park and its many native fauna inhabitants. 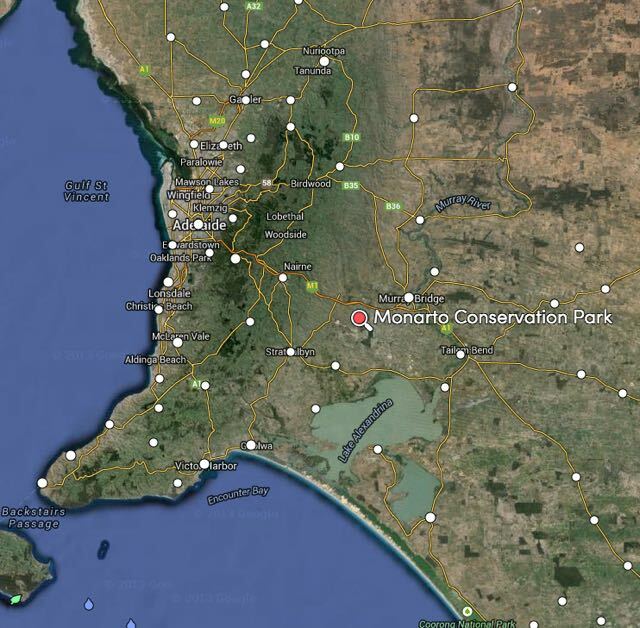 Monarto CP is a typical mallee park and contains some gums, sheoaks, and native pines. A number of native orchids can be found in the park. The best time to see the native plants out in flower is late Winter and Spring. The park is home to the vulnerable Mallefowl (or Lowan). For more information on Malleefowl in the Monarto area, please have a look at the Malleefowl Monarto website at…..
For this activation, I used the regular equipment…..my Yaesu FT-857d, 40 watts, and the 40m/20m linked dipole supported on the 7 metre squid pole. I used the permapine fence in the carpark as an anchor point for the squid pole, which I secured with 2 octopus straps, as it was a little windy at times. Prior to calling CQ I had a quick look around the 40m band to see if I could find some of the other park activators. There were a planned 8 parks to be activated around South Australia that afternoon/evening (as it turned out there were 9). It wasn’t long before I heard Arno VK5ZAR, calling CQ on 7.100. Arno was my first contact and a ‘park to park’ to boot. Signal reports of 5/8 were exchanged both ways. I then found Col VK5HCF in QSO with a VK3 station, on 7.085, with a lovely 5/9 signal from the Naracoorte Caves National Park, VKFF-380. Col was my second contact (5/9 both ways). Two parks down. But at this point I didn’t hear any other park activators, so I moved up to 7.105 where I put out a CQ call and this was immediately answered by Jim VK5TR with his normal 5/9 + signal, and this was followed by Terry VK3UP and then David VK5LSB. There was quite a pile up of stations calling, so I thought I would take a break from the general home callers, and I asked for any QRP, mobile, or portable stations, and this call was answered by Les VK5KLV who was portable in The Dutchmans Stern Conservation Park near Port Augusta in the north of South Australia. Although Les was running QRP, he was an excellent 5/8-9 signal to Monarto. This was followed by another ‘park to park’ QSO. This time with David VK5NQP, who was portable in the Sandy Creek Conservation Park, north of Adelaide. David’s signal was very strong, 5/9 +. This was followed by a third ‘park to park’ contact, and this time it was John VK5BJE, who was portable in the Scott Creek Conservation Park. I then called CQ again for any QRP, mobile, and portable, and this was answered by Greg VK5GJ at Meadows, running his usual QRP, and then Bernard VK3AV who was mobile in the Kinglake National Park in Victoria. I then went back to calling CQ for general callers. I always try to give the QRP, mobiles, and portables a shot. I know how hard it is sometimes to break through the plethora of callers running higher power in generally ideal conditions from the comfort of home. I worked a number of other home stations in VK3 & VK5, and then again called for any QRP, mobile and portable, and that call was answered by Greg VK5ZGY who was mobile in the South East of South Australia, with a nice 5/8 signal. I then worked Derek VK3FAFC who was running QRP, just 2.5 watts. Derek was portable in western Victoria, and although was low down (5/1), was very readable in Monarto. This was followed by a contact with Ian VK5IS in Beetaloo Valley in the Mid North who was running just 5 watts. This was followed by a contact with Peter VK3TKK who was mobile. This was a real struggle for Peter who was copying me just 4/1. However, with the non existant man made noise in the park, I was able to hear Peter very well. A few QSOs later I worked another mobile station. This time it was Robin VK5TN, who was mobile at Mount Gambier in the South East, running a 1/4 wave loaded whip on the front of his car. 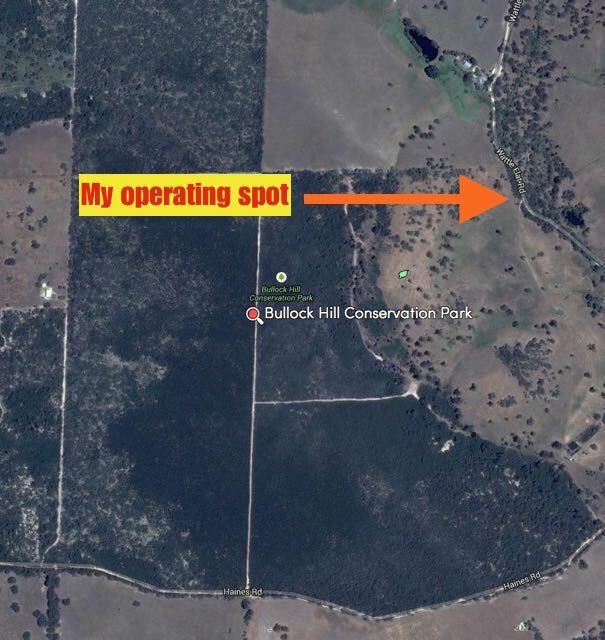 My next caller was Larry VK5LY, who was operating portable in the Cooltong Conservation Park in the Riverland region of South Australia. Larry had with him, Peter VK5FLEX, who was out and about for his first ever park activation. Larry and Peter had terrific 5/9 signals. Congratulations Peter. Welcome to the world of portable operation. A few QSOs later I was called by Bob VK5FO who was operating portable in the Morialta Conservation Park in the Adelaide Hills. Bob had a very nice 5/8 signal to the Murray Mallee. My last QSO before heading over to 20m was with Colin VK3ZZS, who was portable at Moe in a motor home, using a long wire antenna. I have often been called whilst in a park or on a summit, by Colin in his journeys around eastern Australia. It wasn’t worth pursuing things on that frequency on 40m, as some VK4’s had moved in to 7.106, just 1 kc above me, for an apparent sched. Two were very strong, and how they couldn’t hear the other stations that were working me is beyond me. Perhaps they did, and just didn’t bother. It seems to be a bit of a pattern with some scheds, that they are not prepared to move despite who might be operating close by. I then QSYd to 20m, and tried for 14.310, my nominated operating frequency. But this was going to be impossible. There were the regular German speaking nets, Over the Horizon Radar, and a station operating on LSB. Absolutely no point calling CQ there, so I had a quick listen across the band. Although there were some Europeans and Japanese present on the bands, signals were still a little low. The local time was coming up to 6.30 p.m., so long path Europeans signals were still building. I put out a few CQ calls on 14.263, but no takers, sadly. I headed to 14.156 where the normal daily sched is held between a number of VK’s, ZL’s and G’s. The group is generally run by John EA7BA, who lives in Almeria in Spain. John was there, and his signal was very good (5/9). It took me two goes, but I managed to book in. Some people are incredibly quick on the mic and don’t leave pauses between overs, which makes it difficult to chime in, particularly if you are not running high power. But I made it, and had a chat to John who gave me a 5/8 signal report. Alain F4GHB gave me a 5/5 signal report from France. I then tuned across the band and spoke with EA3BDE in Spain (5/9 sent and 5/5 received), Fred IK4JPK in Italy (5/9 sent and 5/7 received), Hardy DL2HRT (5/8 sent and 5/2 received), and Michael IZ4ZZB (5/9 sent and 5/6 received). I even managed a QSO with my very good friend Marnix OP7M (5/7 sent and 4/5 received). I then went back to 40m as I had received an SMS message from Andy VK5AKH to say that he was out and about, portbale. I found Andy on 7.090 calling CQ with a very nice 5/9 signal from the Horsnell Gully Conservation Park. This made number 8 park, and my 9th park to park contact for this activation. I was very pleased to get all of the park activators in the log. I then called CQ on 7130 until just before 0930 UTC when the 7130 DX Net commenced. During that 20 minute period I made a total of 11 QSOs into VK2, VK3, VK5, & ZL. I stuck around for one round on the 7130 DX Net and worked Roy VK7ROY (Net control), William FO5JV in French Polynesia, Adrian ZL1GBG and Caleb ZL2ML. I then moved up to 7.155 where I called CQ and this was answered by Bill ZL2BGX in Alexandra in New Zealand. Bill had a very strong 5/9 signal and I received a 5/8 signal report from the South Island. I was also called by Maurice ZL2MF mobile, about 120 km south of Auckland (5/8 both ways). I also spoke with Andrew VK5MR who was mobile near Mount Bryan in the Mid North of South Australia, using an IC7000 and a Terlin antenna. Andrew activated a few parks last year for the 1st anniversary of the VK5 Parks Award, and we spoke about his improved portable operating set up, and the fact that he was going to activate some parks again this year for the 2nd year anniversary. Great stuff Andrew. It was about this time that Jeff VK5HEL arrived. Jeff lives just down the road at Murray Bridge, and until recently lived in Tasmania. Jeff and I had spoken on 40m a little earlier in the night, with Jeff indicating that he might pop out. It was good to catch up with Jeff and put a face to the name, and show him my operating conditions. I got Jeff behind the mic just once. And that was to talk to his old mate from Tasmania, Greg VK7FGGT. Otherwise, Jeff sat back, and had a listen while I worked the park hunters. I worked a few more QRP hunters including Nev VK5WG, Matt VK3FORD running 5 watts, and Tony VK3CAB running 8 watts from a Chinese transceiver. I also spoke with Craig VK6VCK mobile in Western Australia, and my old mate Ted VK6NTE. I made the mistake of telling Ted I was a bit hungry and thirsty. Ted went on to tell me that he was sipping on a nice cold beer and had just finished a mixed grill. Thanks Ted! My last contact for the evening was with Peter VK4PQ in Townsville in Far North Queensland (5/9 both ways). The band was in excellent shapr, but it was getting late. In fact 10.00 p.m. So I packed up the gear and got back on the road, heading for home, after saying ‘see ya later’ to Jeff. I was very pleased with a total of 79 contacts in the log. This was another great Summer afternoon/activation event. The next fortnightly event will be held on FRIDAY 13th FEBRUARY 2015. Below is a video of the activation which I have placed on You Tube….. There is some very exciting news about the parksnpeaks site. It now features an audible tone when someone is ‘spotted’ on the site, either as a SOTA activator, a parks activator, QRP, etc. The current sound is that of a goat bleating (as per SOTAWatch). However, Allen is working on a unique sound for non SOTA spots. I am sure that everyone is aware of parksnpeaks. It is the creation of Allen VK3HRA and is a spotting and alert facility for VK SOTA, Parks, QRP Activators and Chasers/Hunters. There is an excellent ‘Help’ page on Allen’s site which describes the background and history of parksnpeaks, and also describes the various portable activities. It can be found at….. So now, if you’re in the shack, and you are logged in to parksnpeaks, and an activator is spotted, you will hear the audible alert. A fantastic addition of an already excellent site. This will greatly help park activators and hunters. Andrew VK3ARR also has an ‘Android’ app. Andrew is working on another sound for the parks ‘spots’. At this stage the sound of a Kookaburra singing, appears to be the favourite. More information can be found at Andrew’s WordPress site at….. I have mentioned this many times on the VK5 Parks Yahoo group, the WWFF Yahoo group, here on my WordPress site, and in the Out & About newsletter, but PLEASE……. There continues to be a trend amongst many park hunters in particular, to work the park activator and then move on. Why? I don’t know why? By spotting the activator, you are not only helping the activator, but also helping your fellow chasers/hunters. Many of the National Park activators are trying to reach the 44 QSO threshold for the WWFF global awards. So any contact is precious. And by you spotting the activator, you may just drum up that 44th QSO for them. But spotting is also done for the consideration of other chasers/hunters. You may also want to spot the activator on the DX Cluster. What is the DX cluster? Well in essence it is a ‘chatroom’ or node, into which hams can post information about stations that have either worked or heard. The DX cluster is a worldwide network of connected computers that collect, store and disseminate information that amateurs send to it. There are thousands of nodes around the world, connected together via the internet or radio. 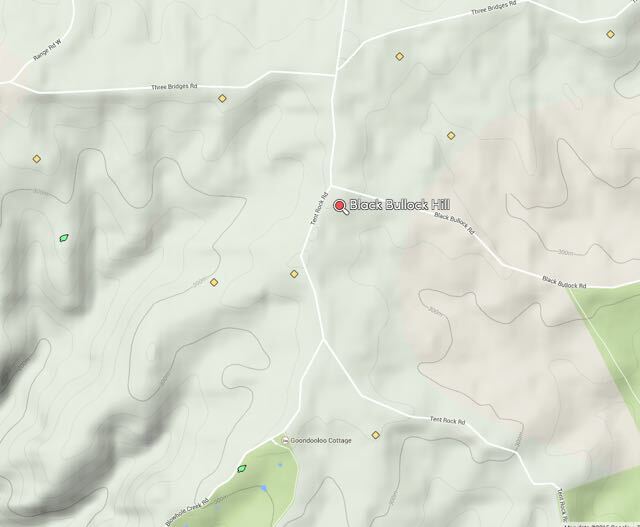 Below are some links to some of the various clusters….. So come on chasers & hunters. Don’t just work the activator and move on. Have some consideration for the activator and your fellow chasers and hunters. It only takes a few minutes to place a spot. And your actions will certainly be appreciated by both the activator and the many chasers/hunters. After getting home in the afternoon from the Fleurieu Peninsula, I decided to head out after tea, to do a ‘twilight’ activation at the Mount George Conservation Park. This is just a short 10 minute drive from home, a little further to the west, along the South Eastern Freeway. I set up at the end of Mount George Road. No need for my fold up table and deck chair, as there was an already provided wooden table and bench for me. For this activation I ran the Yaesu Ft857d, 40 watts and the 40m/20m linked dipole. After setting up I booked in to the 7130 DX Net on 40m where I worked a total of 11 stations. This included a little bit of DX: William FO5JV 5/9 sent and 5/5 received), and Brian ZL2ASH (5/9 both ways). I also made contact with Chris (VK3FY) operating the special event call of AX16AC for the Asian Cup Soccer tournament (or football for the purists). And also Adrian, DL1ADI/VK3 in the Grampians National Park. 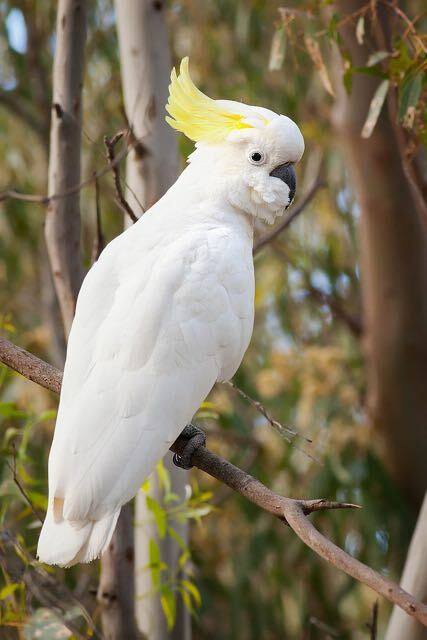 The sulphur crested cockatoos were creating a hell of a noise whilst I was on the net. It was starting to get dark, when they become very active. A few people on the net, commented that they could hear them in the background. I then left the net and moved up to 7.150 where I put out a CQ call, and this was answered by Steve AX5SFA who was 5/9 ++. I went on to work a total of 30 stations on 7.150 in VK2, VK3, VK4, VK5, VK6, & VK7. The band was in very good shape. However, there were a few static crashes present, and sadly at times, the very loud Over the Horizon radar. I would love to know where that originates from? There are a lot of theories. Thanks to Rob VK4FFAB who spotted me on the parksnpeaks site, and also the Amateur Radio (HAM) Australia Facebook site. I’m sure this brought in a lot of callers. Prior to packing up I decided to have a quick listen on 20m. Specifically the Southern Cross DX Net on 14.2385. This is held daily, at 1130 UTC and Net Control is Jack W1FDY. Jack was coming in quite well, with a 5/9 signal and he reciprocated with a 5/6 signal report. Not bad for 40 watts and my very basic linked dipole. I also spoke with my good friend Bill W1OW in Massachussetts (5/5 both ways), Peter AX3CFA in western Victoria, and Andy (E51AND) in the South Cook Islands, using the special call of E50A to celebrate the 50th Anniversary of Self Governance in the Cook Islands. It was starting to get cold and late (10.45 p.m.) so it was time to pack up and head home. I had a total of 45 contacts in the log. 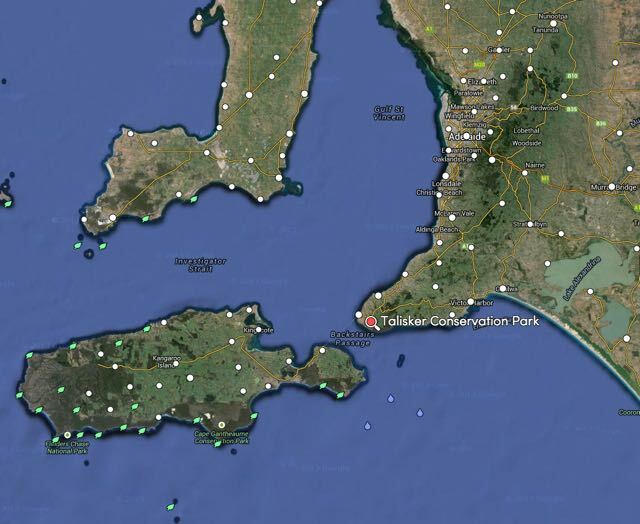 Without a shadow of a doubt, one of my favourite parks in South Australia, is the Talisker Conservation Park (CP), situated on the Fleurieu Peninsula, about 100 km south of Adelaide. This was my second activation for Australia Day 2015. The park is just a short drive from Black Bullock Hill, VK5/ SE-016 (my SOTA activation). I travelled back up Tent Rock Road and turned left onto Three Bridges Road and headed west until I reached Range Road West, where I turned left. About 1.5 km further up you will reach Rarkang Road. There are some signs here indicating the old Talisker Mine. Turn left into Rarkang Road. Travel another @1 km south along Rarkang Road, and you will reach the intersection with Talisker Road. You can continue south along Rarkang Road (it becomes a dead end – to private property) and follow the eastern boundary of the park, but your options along there to set up are limited. The scrub is very thick and there is nowhere really for you to park your car. Plus, there are a number of holiday homes on the western side of the road, which may throw off some noise on the bands. So I took Talisker Road and headed south west. Talisker Road cuts right through the heart of the park. This is very pretty scenery through here. The terrain is quite steep and the scrub is very thick. There are some sensational views of nearby Kangaroo Island. If you are in a conventional vehicle, take it a little easy, as although the dirt road is in good condition, it is quite steep in sections and can be a little slippery undertoe. Talisker CP is about 212 hectares in size and preserves some very beautiful native scrub. The park was established in 1985 and contains remnants of Fleurieu Peninsula scrub, some steep walking tracks and the heritage-listed remains of a nineteenth century silver and lead mine. The park had been the scene of intermittent mining activity until it was gazetted on 28th November 1985 as a Conservation Park (Wikipedia and other sites state 1976). The park is home to a large variety of wildlife including Western Grey kangaroos, Southern Brown bandicoots, and Short-beaked echidnas. It was alive with birdlife whilst I was there, including Superb Blue Wrens and Yellow tailed black cockatoos. And again, the native flowers were out, attracting a huge number of butterflys. I have activated Talisker CP once before, back in April 2014. For more information on that activation, please have a look at my previous post….. I set up on the north western side of Talisker Road at the old camping ground area. Unfortunately, the track leading to the cleared area is now blocked off for vehicles. But there is a carpark here and you can walk a short distance to this area and the toilet block. I set up my little fold up table and deck chair. However, if I had looked a bit closer, there is a wooden table and benches on the other side of the scrub, under some beautiful shady trees. Just perfect for an activation. For this park activation I used my Yaesu FT-857d, ran 40 watts output, and the 40m/20m linked dipole. The ground was way too hard for me to use the squid pole holder, so I improvised and used a small sapling to secure the squid pole, with an octopus strap. Not ideal, but it worked. Again, for this activation, I used the special call of AX5PAS, as it was AUSTRALIA DAY. We only get to use that special prefix three times a year, so I thought I would put it to good use. I found 7.095 to be clear, which was my nominated operating frequency. I aksed if the frequency was in use and was immediately greeted by my old mate, Larry VK5LY in The Riverland. Larry was a beautiful 5/9 and he returned me the compliment and gave me a 5/9 signal report. This was followed by a contact with Greg VK5GJ at Meadows in the Adelaide Hills, running QRP, just 4 watts (5/4 sent & 5/9 received). Another good mate then called in, Dave AX3VCE in north western Victoria, followed by Amanda VK3FQSO, running QRP again. And again this time, just 500 milliwatts, with an excellent 5/5 signal from Wedderburn. About 8 QSOs later, I received a call from Marshall AX3MRG who was portable in the Lake Eildon National Park, which qualifies for both the Keith Roget Memorial National Parks Award and the World Wide Flora Fauna (WWFF) program. Marshall had a good 5/4 signal coming into Talisker. Two QSO’s later, I spoke with Andrew VK1DA who was portable on SOTA peak, Mount Mundoonen, VK2/ ST-053, east of Yass. Andrew had a good 5/4 signal into the Fleurieu. And then a few QSOs later I was called by Tony AX3CAT who was on SOTA peak Britannia Range, VK3/ VC-011, east of Melbourne (5/7 both ways). I continued to work the VK stations, including some QRP and mobile stations. This included Peter VK3TKK running just 5 watts (5/5 both ways), Andrew AX3ARR also running 5 watts (5/9 both ways), Ian VK5CZ mobile 20 km north of Clare (5/8 sent & 5/9 received), and then Greg VK5ZGY who was mobile in the South East. 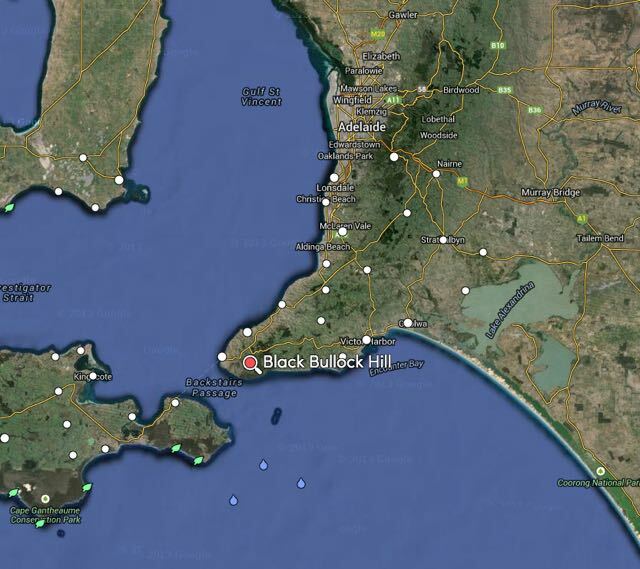 And then to my surprise I received a call from Mark VK6BSA near Esperance in Western Australia. Mark was a good strong 5/8 signal and gave me a 5/3 signal report in return. It is not very often that I’ve worked into VK6 on 40m, at this time of the day whilst portable. 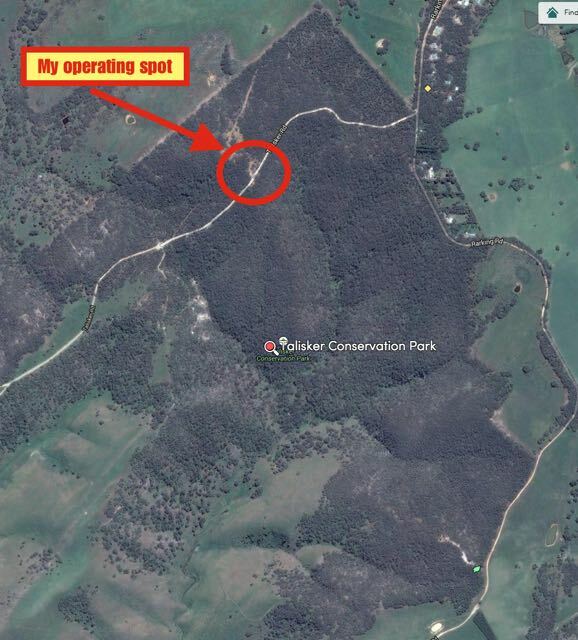 A few QSOs later I was called by Tom AX5AA and Col VK5HCF, both portable in the Dingley Dell Conservation Park. They were coming in well, with 5/9 signals from the South East. A lot better than we had experienced earlier whilst I was on Black Bullock Hill. It was great to get Tom and Col in the log, and have a VK5 ‘park to park’ contact for the VK5 Parks Award. And then a few QSOs later I received a call from Tony AX3CMZ at an Australia Day event near Bendigo. Tony was struggling to hear me a bit, as there was lots of man made noise QRN at his end, at the event which had about 2,000 people in attendance. I then worked another QRP station. This time, Nev VK5WG running just 5 watts from his little X1M transceiver (5/9 both ways). When the activity on 40 m had slowed, I took the opportunity of lowering the squid pole and removing the links in the dipole, and trying my luck on the 20 m band. I put out a CQ call and this was answered by Frank VK3GFS/2, portable at his son Adam VK2YK’s house near Newcastle. Frank was a fantastic 5/9 plus signal. I also spoke with Adam VK2YK (had spoken with him a little earlier on 40m). But during one of Adam’s overs on 20m, a signficant ‘whooshiing’ sound came onto the frequency and lasted for about 20 seconds. It was very loud and very pronounced. I thought that maybe something was wrong with the antenna, so I quickly tuned down the band, only to find that the noise was across the portion of the 20m band that I listened to. And Adam’s signal had dropped from 5/9 plus to about 5/8, and there was lots of noise on the frequency. Adam then handed it back to me, and I informed Adam of what I had just heard on the band. When I handed it back to Adam, he reported that the noise floor had also increased significantly and my signal had dropped dramatically as well. We both came to the conclusion that it was most likely due to a solar flare or Coronal Mass Ejection (CME). Anyway I pushed on, and called CQ again, and this was answered by Nigel VK6NI, near Denmark in Western Australia. Nigel was my final contact in the park (5/8 sent and 5/3 received). Following my activation and packing up the gear, I decided to go for a look at the old mining area. The park incorporates the old Talisker silver-lead mine, which is of significant heritage value. Silver was discovered in 1862 by John McLeod. The area was named after a locality on the Isle of Skye in Scotland. Below are some photographs of Talisker in Scotland. I highly recommend taking the walk down to the mine. It is a little steep, but the walk is graded as ‘moderate’. Take your time. It is worth the effort. There are interpretive signs along the way, with some magnificent ruins still in tact. Lots of history there to be seen. The Talisker mine employed Cornish miners and supported a nearby township called Silverton. The population of Silverton grew to 3000 at its peak in 1870. The Talisker Mining Company worked the mine until falling ore grades and a lack of finance, forced the mine’s closure in 1872. Between 1917 to 1920, the mine was worked again, mainly for arsenic. The former Postcards television program, visited the area some years ago. Here is a link…. And there is also an excellent brochure on the history of the mine, written by Mines & Energy South Australia. Here is a link…..
Below are some photographs of the mine from the South Australian State Library online collection…. After having a look around the mining area, I walked up to the lookout area. This is just a short 10 minute walk from the carpark, and again, well worth the effort. You will be rewarded with some spectacular views of Kangaroo Island, the surrounding countryside including the Starfish Hill windfarm, and the mining area. I found the photos below on the State Library site. Thought people might like to see the ‘then and now’ photographs…. After I had finished walking around the mining area, I drove a little further south west along Talisker Road. The road becomes a dead end and unfortunately there is no access to the coast, as the land becomes private property. However, it is well worth going to for a look as there are some spectacular views across Backstairs Passage to Kangaroo Island. You will also be able to view the south western side of the park. This was a very enjoyable activation, with a total of 43 contacts in the log over an hour & 20 minute period. 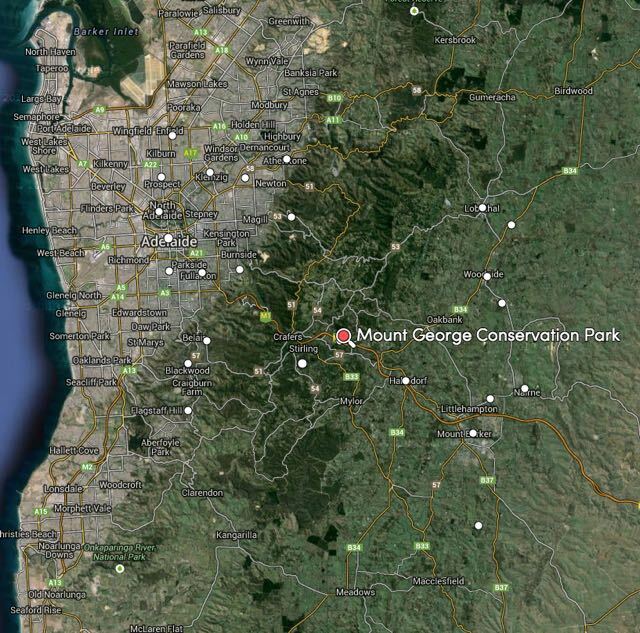 This included two SOTA contacts, one Victorian National Park, and one South Australian Conservation Park. Natural Resources Adelaide and Mt Lofty Ranges, ‘Deep Creek and Talisker Bushwalking Guide’, 2014. For Australia Day (Monday 26th January 2015) I headed down to the Fleurieu Peninsula, south of Adelaide, where I activated Black Bullock Hill, VK5/ SE-016 as part of the Summits on the Air (SOTA) program. The summit is the highest point of the Fleurieu Peninusla, and is located near the little town of Delamere, about 100 km south of Adelaide. This is not a ‘traditional’ summit, in that it is not a hill or mountain. But it is the highest point on the Fleurieu Peninusla, and qualifies for the SOTA program under the 150 prominence rule. I have activated the summit two times previously. In fact it was my first ever SOTA activation, way back in March, 2013. For more information on those activations, please have a look at my previous posts….. It is a beautiful drive from my home in the Adelaide Hills, down to the summit. I got up early though to miserable weather. It was raining, and I was worried that I might have to cancel the activation. 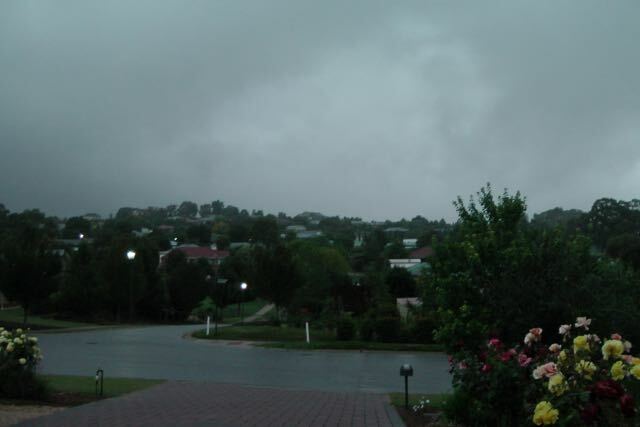 This was weather that we are certainly not used to on Australia Day in the middle of Summer. Above- the view from my front yard, first thing in the morning. Not good! Anyway I packed the car and headed off through Echunga, on to Meadows, and then on to Willunga via Brookman Road, travelling passed the beautiful pine forests. They were still packing up the marquees at the top of Willunga Hill where they held the King of the Mountain for the Tour Down Under cycling event. From there I cut across to Myponga through Pages Flat, and then travelled south until I reached the towns of Yankalilla and Normanville. I then travelled south along the Main South Road, following the coastline and the amazing views, until heading back inland to Second Valley. This is truly, very beautiful countryside. From there I reached the little town of Delamere, where I turned left onto Range Road and headed east. Once I reached Three Bridges Road I turned right and headed south until I reached the intersection of Three Bridges Road, Dog Trap Road, and Tent Rock Road. The summit is located on the south eastern corner of this intersection. I encountered numerous kangaroos along the way, so it was slow going. This resulted in me, having to pull over and amend my alert on SOTAWatch, delaying the activation by one hour. As I had sought approval from the land owner prior to heading to the summit, I parked my car down Dog Trap Road, and walked up to the summit, and with some care, climbed the electric fence and approached the trig point, which is just a short distance inside the fenceline. It is hidden a little by the thick scrub on the eastern side of the road. It was here at the trig point, that I set up my equipment. For this activation I used my Yaesu FT-817nd, 5 watts output power, and the 40m/20m linked dipole supported on a 7 metre telescopic squid pole. I powered the radio with a 12 volt 4 ah SLAB battery. I secured the squid pole to a squid pole holder, with the assistance of an octopus strap. And for this activation, I used the special AX prefix to celebrate Australia Day. No creature comforts here at the summit. I sat alongside the trig point, with my back propped up against the trig. At home, amongst the ants and the other creepy crawlies. And the weather was miserable. Although it had stopped raining, it was freezing cold. The Southern Ocean was in sight, and the breeze off there was very chilly. The nearest land to the south is Antarctica, so no wonder it is a cold spot. Unfortunately, the issue of no rain was not to last. And as I found out during the activation, there were a few times I had to seek shelter underneath my bothy bag. Prior to calling CQ I had a quick look around the band and soon found Col VK5HCF calling CQ from the Piccanninie Ponds Conservation Park in the South East of South Australia. I was aware that Col and Tom VK5EE were going to venture out that morning for the activation, and I was hoping to get them in the log for the VK5 National and Conservation Parks Award. Only trouble was, Col was virtually unreadable. He was so low down and faint, that I didn’t even bother calling because I didn’t think I would get through. This was very disapointing, as I was hoping to work Col whilst he was in the Conservation Park. But things were to only get worse. I then found John VK5BJE, calling CQ from the Belair National Park in the Adelaide Hills. John was the second VK5 Parks activator that I knew as going to be out and about that morning. And he too was so low down, that again I didn’t bother even trying to make the contact. In fact, John’s signal was even lower than Col’s. This was not a good start to the morning’s proceedings. So with a fair degree of disapointment, I found 7.105 to be clear and put out a CQ call. This was immediately answered by Amanda VK3FQSO with a nice strong 5/8 signal from Wedderburn. And this was followed by Julie VK3FOWL, also 5/8, and then Bandor AX3FKSA who was also 5/8. Three Foundation call,s running 10 watts, with excellent signals. It appeared that the further afield stations were coming in well. But there was no close in propagation. My fourth qualifying contact for the summit, was with John, AX2YW in Wagga Wagga who was a very strong 5/9. My 7th contact in the log, was Mike, VK6MB in Perth, Western Australia, who was a very nice 5/8 signal, some 2,700 km away. Mike gave me a 4/4 signal report from my 5 watts. Not great, but we still made the contact on 40m, which is not always possible at such great distance. It is always a challenge to get the VK6 boys on 40m. A few QSOs later I was called my Peter AX3PF/7 who was portable in Narawntapu National Park in northern Tasmania. Peter was a nice strong 5/8 signal from his portable set up. And then a few QSOs later I had another National Park in the log. This time it was Marshall AX3MRG who was portable in the Lake Eildon National Park in central Victoria (5/5 sent and 5/6 received). When things started to slow down a little on 7.105, I took the opportunity of tuning around the band, and I was very pleased I did, because I found Col VK5HCF on 7.100, calling CQ. And this time he was readable. Not a lot better. But at least readable from Piccanninie Ponds Conservation Park. Col and I exchanged 5/1 signal reports. Not strong signals, but one of the benefits of working portable. You can ‘hear a pin drop’ so you can generally work the weakest of signals. If only it was like that at home! I then went to 7.090 and called CQ and worked a further 19 stations in VK1, VK3, VK5, & VK7. This included my first summit to summit of the morning. This was with Ian VK1DI who was portable on SOTA peak, Mount Majura, VK1/ AC-034 (5/3 both ways). A few QSOs later I was called by Tony VK3CAT/p, who was portable on SOTA summit, Mount Bride, VK3/ VC-009, near Warburton (5/7 both ways). Again, when things slowed down on 7.090, I took the opportunity of having a look around the 40m band again. And again, I was rewarded with doing this, because I found John VK5BJE calling CQ from the Belair National Park. And not only had John’s signal improved. It had improved dramaticlally. It had gone from being virtually undetectable, to now a good strong 5/8. John and I were so happy to make the contact (5/8 sent and 5/9 received). 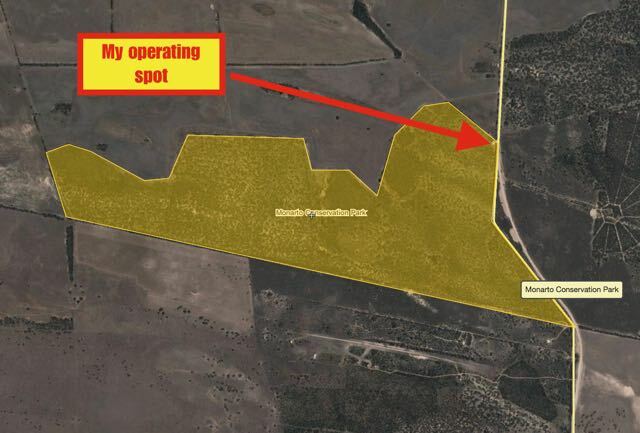 I then worked Tom AX5AA (VK5EE) in the Piccanninie Ponds Conservation Park, on 7.100. Again, Tom’s signal had gone from being very faint, to a good strong 5/8. The 40m band was certainly doing some peculiar things. I then found Reuben VK7FREU, calling CQ on 7.080 from SOTA summit Mount Wellington, VK7/ SC-001. After working Reuben, I also spoke to his Dad, Justin VK7TW, who was on the summit with Reuben. Again, not strong signals. But very comfortable contacts, due to non existant man made noise floor. I then went to 7.085 and worked a further 8 stations in VK3, VK3, & VK5 before the UTC rollover, including Gerard AX2IO who was mobile. The 40m band was certainly behaving peculiarly, but was still allowing for some very good contacts into the eastern states. After the UTC rollover I called CQ on 7.090 and worked a total of 20 stations in VK3 & VK5. This included Peter VK3PF/7 in the Narawntapu National Park, Tony AX3CAT on VK3/ VC-009, Marshall AX3MRG at Horseshoe Bend in the Lake Eildon National Park, and Tom AX5AA & Col VK5HCF, both in the Ewens Ponds Conservation Park. Another highlight was working Amanda VK3FQSO who was running QRP on just 500 milliwatts. Amanda was a very nice 5/5 signal despite the very low power. I also gave 20m a quick shot and worked a total of 5 stations there in VK2, VK4, & VK6. This included Gerard AX2IO who was mobile. So, after 2 and a half hours on the summit, I had a total of 74 contacts in the log, including one South Australian National Park, two South Australian Conservation Parks, one Victorian National Park, one Tasmanian National Park, and three Summit to Summit contacts. I was very happy. It was time to pack up, and head off to my next activation, which was the Talisker Conservation Park. 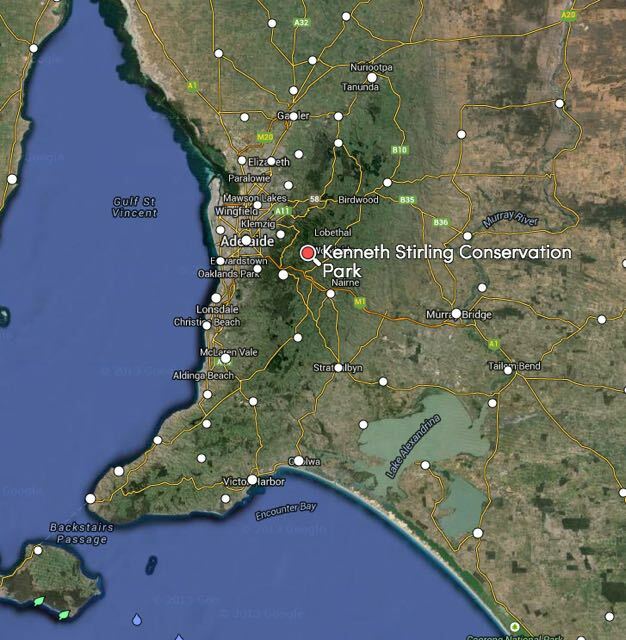 Yesterday afternoon/evening (Friday 23rd January, 2015, I activated the Kenneth Stirling Conservation Park, in the ‘Adelaide Hills’ Mount Lofty Ranges. The park is situated about 16 km east of Adelaide, and is close to the little town of Carey Gully. It just a short drive from home. I have activated this park previously on 2 occasions (2013 and 2014). For details on those activations and more information on the park, please have a look at….. I have talked about the history of this park previously. But it is extremely interesting and is well worth mentioning again. The park is named in honour of Kenneth George Stirling, who was an accountant and benefactor. He died suddenly in 1973, of heart disease, aged just 38. Stirling earnt considerable wealth due to shareholding in mining interests, and apparently this paper value embarrassed him. According to his wife, ‘he believed he hadn’t earned the money the mining boom brought him’ and ‘his main concern was to use it for the good of the community’. He was a member of the Nature Conservation Society of South Australia and other organisations and over the years made several anonymous gifts including $200,000 to the Australian Conservation Foundation (ACF) to establish national parks in South Australia. The money he gave to the A.C.F. helped to establish national parks at Montacute and Mount Scott, both near Adelaide, and in the extension of existing reserves at Scott Creek, in the Mount Lofty Ranges, and Warrenben, on Yorke Peninsula. 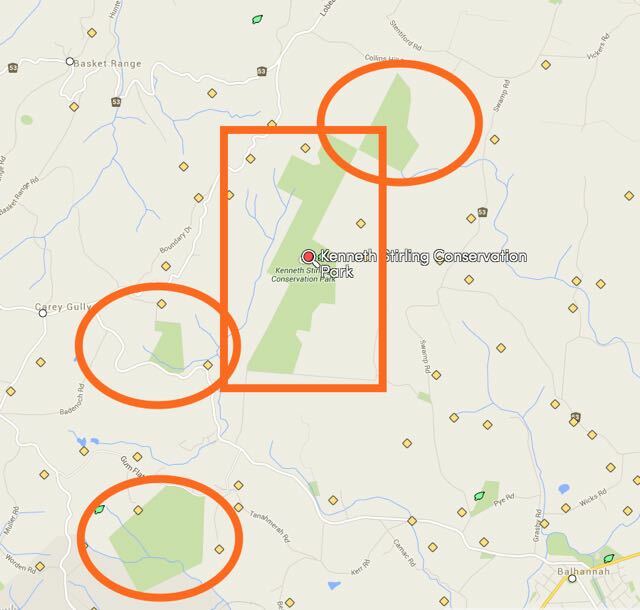 In 1990 the State government acquired land in the Adelaide Hills for the Kenneth Stirling Conservation Park. He sounds like a very humble and fascinating fellow. And it is to his credit, that we now have some beautiful conservation parks in South Australia. For more information on Stirling, please have a look at….. The park is unique in that it is separated into four autonomous sections: Wotton Scrub, Filsell Hill, White Scrub, and Burdett Scrub. The largest section being Filsell Hill. As I had activated the Wotton Scrub Section previously, I tried to get into some of the other sections. Firstly, I went to the ‘Filsell Hill’ section. I travelled down Ostigh Road off Greenhill Road and saw the park on my right. But the scrub was very thick and very difficult for portable operation. As I travelled north, I reached a ‘dead end’ and an entrance to private property. However, Google maps shows Ostigh Road continuing to the north. It doesn’t! I then went to the White Scrub section on Greenhill Road, negotiating all of the bicycle riders that were returning to Adelaide, after the world famous Tour Down Under cycling event. The Tour Down Under brings out the best and worst in some bike riders. Including some guys over 50 that should never wear lycra! Anyway, I got to the park and again, found that signposting was very poor and access was difficult. 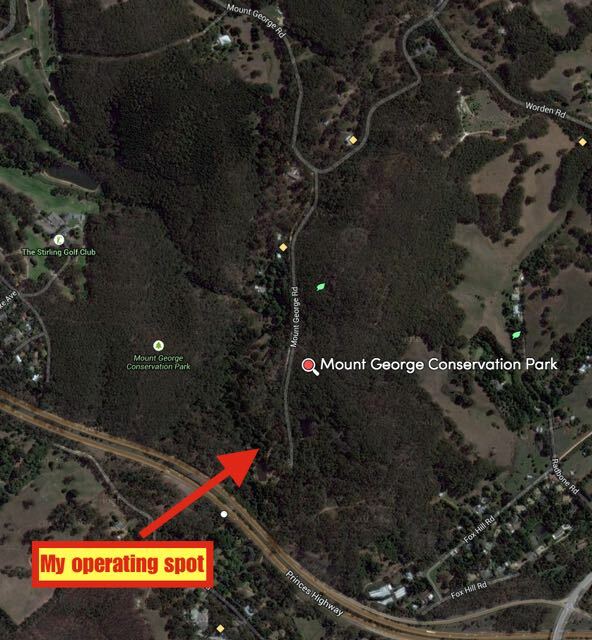 As I was running out of time, I decided to play it safe and I headed to the Wotton Scrub section of the park, which can be easily accessed off Gum Flat Road. There is a small carpark here, off the Gum Flat Road, and a nice cleared area (access track) which allows you to string out a dipole. As the Kandos Group was still running on 7.093, I headed to 7.098 where I put out a number of CQ calls, with no answers. Was something wrong? No, there was nothing wrong with the antenna. The stations on the Kandos Net were coming in very well. So back to 7.098 and some more CQ calls. Again, no takers. I then sent out an SMS message and as a result, David VK5KC gave me a shout with an excellent 5/9 plus signal. This was followed by David VK5NQP, Col VK5HCF and John VK5BJE. It appeared that I had finally stirred up the park hunters. Some of the more interesting contacts here were with Amanda VK3FQSO who was 5/7-9 on just 1 watt, and Greg who was 5/8 also running QRP with 5 watts. I ended up with a bit of a mini pile up and went on to work a total of 17 stations during this period, in VK3 & VK5. But it then slowed again, so I decided this was an excellent opportunity to try out my new 15m dipole. So down came the 7 metre squid pole, off with the 40m/20m linked dipole, and up with the 15m dipole. I tuned around the 15m band but could not hear a lot of activity, except for the very big pile up high in the band, where EP6T in Iran, was operating split frequency. However I did hear Ken JG2MQM speaking with VKs and ZLs on 21.263. So I patiently waited for Ken to finish his QSO and I gave him a call. Although not a booming signal (Ken was 5/8), I did manage to make contact. Ken gave me a 5/6 signal report in return. I then went up a little higher to 21.270 and put out a CQ call and this was answered by Peter ZL1BRL, at Auckland in New Zealand, who was running 100 watts and a Delta loop. Both Peter and I were experiencing lots of QSB on each others signals. But at least my antenna worked. And these were my first ever 15m contacts whilst operating portable in a park, so I was very happy. 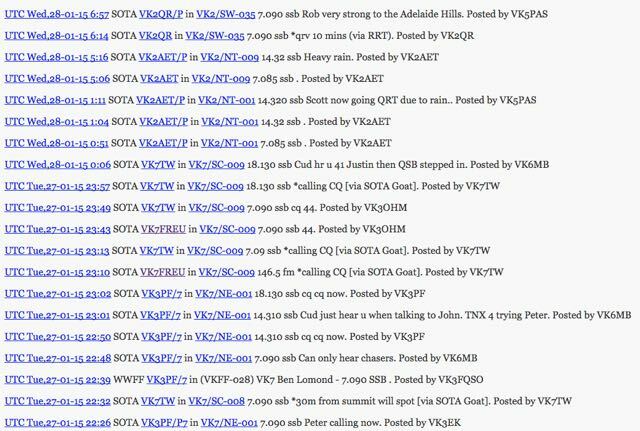 The goat had bleated on my SOTA Goat app on my iphone, and I saw a spot for Rob VK2QR, who was on a SOTA peak in New South Wales, as part of the Summits on the Air (SOTA) program. So I quickly replaced the 15m antenna, with the linked dipole again, and tuned to 7.090 where I head Rob with a very nice 5/9 signal from Gurkeroo Ridge, VK2/ SW-051, south of Tumut in the Bago State Forest. Surprisingly, Rob was not all that busy and I managed to make contact after just the one call. I would also like to congratulate Rob, who made ‘Mountain Goat’ yesterday. Well done Rob for reaching the 1,000 point mark as an activator. Unfortunately I had missed Rod, VK2TWR, who had also been on a summit in New South Wales, but had to go clear due to the rain. I then moved up the band to 7.105 and put out a CQ call and this was answered by the ever keen Peter VK3PF with a nice strong signal. And this was followed by another very active park activator and hunter, Joe VK3YSP (and later followed by Joe’s wife, Julie VK3FOWL). I went on to work a further 14 stations after Joe in VK3, VK5 & ZL. This included Jerry VK3MEK who was running QRP 6 watts from an oval in Melbourne, and Allen VK3HRA running QRP 5 watts, trying out a new end fed antenna in his backyard. The New Zealand contact was with Rob ZL2BTQ who was maritime mobile in Queen Charlotte Sound, near Picton. What a beautiful part of the world. Marija and I travelled to New Zealand for 4 weeks back in 2010 for our honeymoon, and travelled through the Queen Charlotte Sound. I was very pleased to get Rob in the log. Below are some photos I took whilst in that area back in 2010. I then tried my luck on 20m, but I had left things a little too late. There were not a lot of strong signals coming in from Europe. However, I did work John EA7BA in Spain and Steve GJ7DNI in the Channel Islands, on 14.156. The Channel Islands was a new DXCC for me, whilst operating portable. I then put out a few CQ calls on 14.214, and finally got a call from my mate, Ted VK6NTE with his normal 5/9 plus plus signal. And then Caleb ZL2ML in Gisborne in New Zealand. I normally work Caleb on 40m on the 7130 DX Net. Caleb had a very strong 5/9 plus signal here on 20m. It was now 8.30 p.m. so I headed back to 40m and checked in to the 7130 DX Net. My first 4 contacts here, were with Andy VK4TH near Kingaroy in Queensland, William FO5JV in French Polynesia, Brian ZL2ASH in Wellington New Zealand, and Tony VK2RI who was operating portable, on the shores of Botany Bay, with a very nice signal. During the net, I quickly tuned up and down the 40m band, and found Pedro NP4A in Puerto Rico, calling CQ. So I gave Pedro a call and exchanged genuine 5/9 signal reports with him. This was the second time in the past week that I have worked Pedro, whilst out portable in a park. I then returned back to the 7130 DX Net and worked a further 4 stations in VK1, VK2, VK5 & VK7. 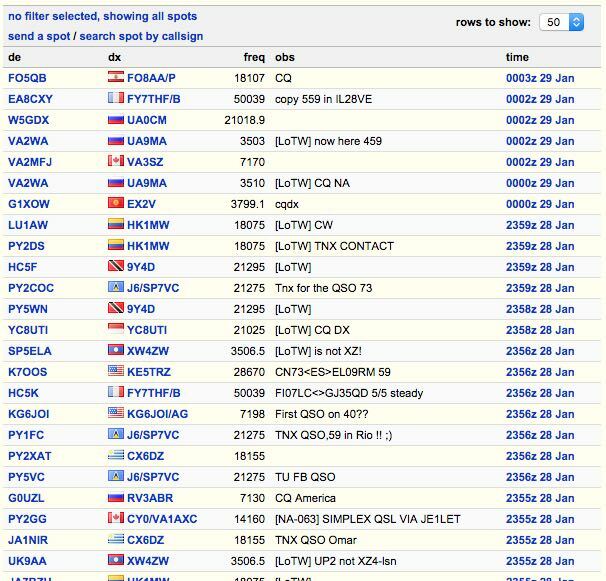 At the conclusion of the net, I put out a few CQ calls on 7.150 and these were answered by Roald VK1FIVE. However, a few minutes into our QSO, a USA station came up alongside of us calling CQ on 7.152. This wasn’t too much of an issue, until a VK2 called him, and that was the end of my QSO with Roald. There was far too much bleed over for us to continue. I have heard n the recent past, a particular amateur ‘complain’ that Australian amateurs are operating above 7.100 in the evenings, thus encroaching on the DX stations operating in that part of the 40m band. However, to try operating below 7.100 during the evenings, is almost impossible, with all of the South East Asian activity. So, after my contact with Roald, I headed up to 7.160 and put out a CQ call, and this was answered by Roald, who had followed me up the band. I worked a further 12 stations here, including my old mate, Bill W1OW in Massachusetts. Bill was 5/8 and he gave me a 4/4 signal report. Not bad, with my 40 watts and a simple dipole. I was also called by Oscar VK4BOV who was running just 10 watts from an Anam QRP Software defined radio. When things slowed down a little on 40m, I headed off to 20m to have a quick listen on the Southern Cross DX Net. However, signals from the USA were very low down. My last contact on 40m, Jim VK3VBC, who is a regular check in to the Southern Cross DX Net, had warned me that signals were poor. Most of the activity on 20m was focussed around 14.183 with the EP6T station in Iran, working split. It was time to head home. Local time was 10.45 p.m. I had a total of 61 contacts in the log, including some very interesting contacts. 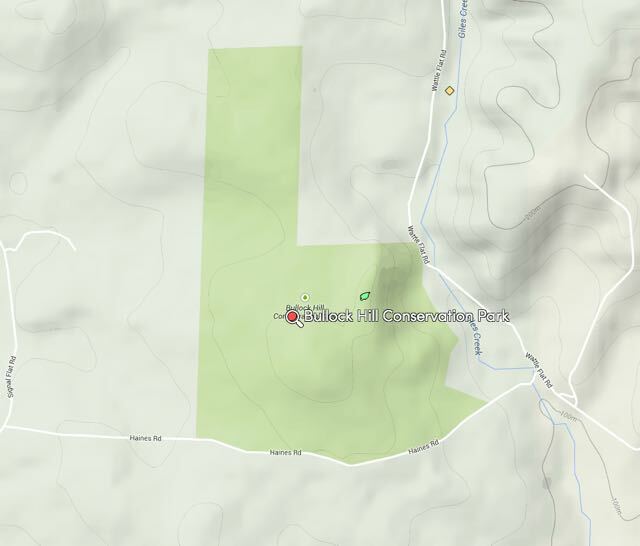 Late yesterday afternoon (Monday 19th January 2015) I activated the Bullock Hill Conservation Park (CP), situated near the little town of Ashbourne on the Fleurieu Peninsula. The park is about 65 km south of Adelaide, and just a short 35 minute drive from home, via Strathalbyn. Bullock Hill CP is a newly gazetted park. It was proclaimed on the 20th January, 2014, so it was just 1 day short of its 1 year birthday during my activation. The park was first activated by Gordon VK5GY. I last activated the park back in April 2014. 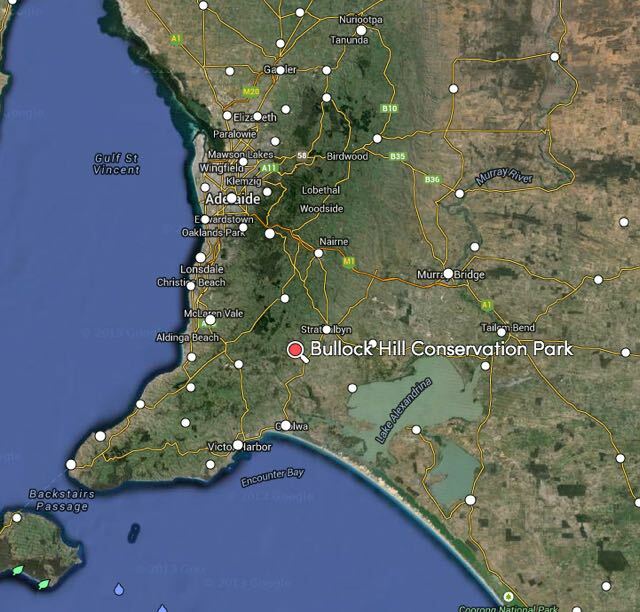 For more information on that activation, have a look at my previous post at…..
Should you wish to read the proposal to constitute the park as a Conservation Park, here is a link to the document submitted by the Goolwa to Wellington Local Action Planning Association Inc…..
Bullock Hill is about 200 hectares in size, with some spectacular gums and very thick bush on the western side of the park. The terrain is hilly. It is home to a large amount of wildlife, as I found out. When I arrived at the park, there were between 30-40 Western Grey kangaroos grazing in the open grassland area on the eastern side of the park. 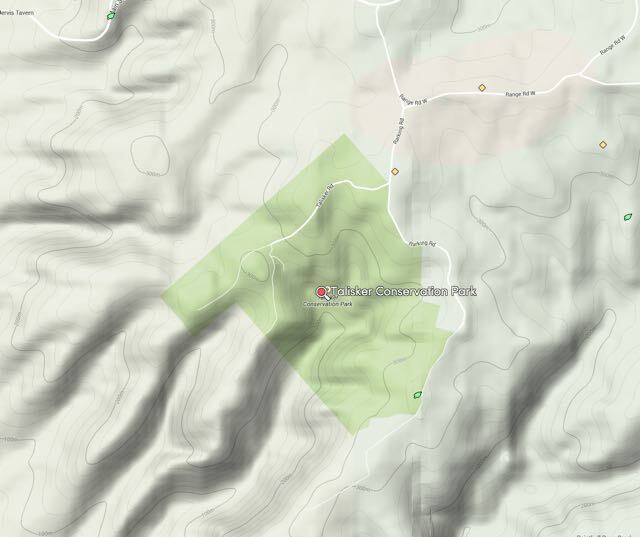 I accessed the park via Wattle Flat Road, which runs off the Ashbourne – Strathalbyn Road. The park is well sign posted. If you are a little more adventurous, you could access the park via Haines Road, but this is 4WD access only. I set up on the eastern side of the park, which is an open native grassland area. There is plenty of room here to string out a dipole, and some small gums to afford some shade. It was a warm afternoon, so the shade was appreciated. The park is deceptive at this location, in that there is not too much scrub here at this point. As you look west towards Bullock Hill itself, there is just a small outcrop of scrub and the occasional impressive gum tree on the grassland. It isn’t until you reach the top of Bulllock Hill, that you can truly see all of the thick scrub on the western side of the park. The climb to the top is quite easy. It takes about 10-15 minutes and offers spectacular views of the Fleurieu Peninsula. There is a wooden table and bench at the top, should you wish to operate from there. For this activation I ran the Yaesu FT-857d, 40 watts output, and my 40m/20m linked dipole, supported on a 7 metre telescopic squid pole from Haverfords. My first contact on 40m was with Peter VK5BWH at Port Augusta, with a strong 5/9 signal. This was followed by the ever reliable park hunter, John VK5BJE, and then Peter VK5KPR and Les VK5KLV, both at Port Augusta. I went on to work a total of 14 stations on 40m in VK3 & VK5. My 44 amp hour power pack was madly beeping at me, despite the fact that I had charged it at home before leaving. So I cut short my QSO with John VK5NJ and Tom VK5FTRG in the South East. I very quickly lowered the squid pole and removed the links in the dipole, and had a quick listen on the 20m band. Although I heard signals coming in from Europe, there were no real stand outs. So I headed down to 14.156 where there is a daily get together of VK’s, ZL’s, G stations. The net is run by John EA7BA, a British expat, now living in Almeria in Spain. John was an excellent 5/9 signal and I received a 5/8 signal report back from Spain. I also worked my old mate Brian ZL2ASH. Brian’s signal was not as strong as usual on 20m, but he was still 5/7. I received a 4/5 from Brian in Wellington. I then put out a few CQ calls on 14.212 hoping that some of the VK6 fellas may call in. But sadly there was no reply. It is made very difficult with no phone app for the parks, such as there is for the SOTA program. I then took the opportunity to charge the battery, whilst I went for a walk up to the top of Bullock Hill. After the short walk to the top, I sat there for about an hour, admiring the view, before venturing back down the hill and firing up the radio again. I returned to 40m and put out a CQ call on 7.135 and this was answered by Joe VK3YSP who was operating QRP with just 5 watts. Joe was a good 5/8 signal and very readable, as there was no man made noise in the park at all. The only noise on the band were the static crashes. I worked a further 6 stations in VK2, VK3, & VK5, before QSYing down to 7.130, where I joined the 7130 DX Net, which was being run by Mal VK5MJ in the Riverland. Mal’s signal was incredibly strong, with the two plus signs showing on the FT857d. I also spoke to Bill W1OW on the net. Bill is located in Massachusetts in the USA. Bill had a very nice 5/8 signal report coming in from The States, and Bill returned a 5/5 signal report to me. I was very pleased with this, with just my 40 watts and a simple dipole antenna. And I also made contact with Bowden ZL1HX in Welsford on the North Island of New Zealand. And to top things off I had a contact with Richard VK2XRC who was portable in the Morton National Park, New South Wales. This park qualifies for the World Wide Flora Fauna (WWFF) program and is VKFF-334. I worked a total of 18 stations on the 7130 DX Net in French Polynesia, USA, New Zealand, VK2, VK3, VK4, VK5, and VK7. This net is always a lot of fun and is held each Monday, Wednesday and Fridays at 0930 UTC. Here is a link to the 7130 DX Net Facebook page…..
After the net I was going to pack up, but the weather was beautiful and the band was in good shape. So I had a quick tune around the 40m band, and I was very pleased I did. I heard Pedro NP4A, calling CQ on 7.145. Pedro’s signal was 5/9 plus. He was being called by a large number of VK’s and Indonesian stations. But I patiently waited for about 10 minutes, and got through to Pedro who gave me a genuine 5/9 signal report. I was very excited. I am aiming for DXCC as a portable station, and Puerto Rico was a new country for me whilst in a park or on a SOTA summit. I then headed up the band to 7.150 and out out a CQ call and this was answered by Paul VK5FUZZ at Wellington on the River Murray. Whilst working Paul I heard some gunshots in the distance, and could see the spotlight off to my south, over the hills. They were perhaps 3 km away, but netherless made me feel a bit uneasy as I was sitting in complete darkness. The night was only lit up occasionally by my headset that I was wearing when I logged a station. But I decided to stay, as it was a beautiful balmy night with very clear skies. I even saw a couple of satellites pass over head as I chatted away on 40m. I worked a further 7 stations in VK2, VK3, and VK4, before deciding to pack up and head home. I was getting hungry and I felt a bit uneasy about the spotlighters as they appeared to be getting a bit closer. They were very close to the Conservation Park. I’m not sure if they were locals and probably have my suspicions that they were shooting kangaroos. With a permit? Who knows? This was a very enjoyable activation. Beautiful surroundings with lots of wildlife, and very good band conditions on 40m. I had a total of 51 contacts in the log. It’s a shame that a few more park activators don’t head out during the evening, as this is certainly when the 40m band is at its best, with propagation possible all across Australia, and lots of DX. Below is a video I took of some of the stations I heard on the 7130 DX Net…..